Update: The Merchant Application Form is now available – click here if you’re interested. Fantasy Faire, the largest fantasy-related event to take place in Second Life, has announced both the theme for the 2019 event and its dates. Once again raising money for the global work of the American Cancer Society as a part of the Relay for Life of Second Life 2019 season, Fantasy faire will this year have the theme of Builders of Hope. So in total, Fantasy Faire will run from Thursday, April 18th through until Sunday, May 5th, 2019, inclusive. As with previous years, Fantasy Faire 2019 will comprise 10 shopping regions hosting 200 of Second Life’s top Fantasy Creators, offering the most comprehensive opportunity for fantasy shopping. In addition, there will be a further six regions focusing on entertainment, the Fairelands Quest, art, the Fantasy Faire Literary Festival, and the Worldling Collection. All of the regions will be designed and themed by some of Second Life’s top designers, making the event a must-see even if fantasy isn’t a major part of your life. And throughout it all, there will be opportunities to show your support for ACS and the global work of cancer treatment, care and prevention via direct donation or by purchasing some of the many items participating merchants will be selling, with all or part of the proceeds going to RFL of SL and the American Cancer Society. As always, I’ll be doing my best to provide updates and relay news on Fantasy Faire through the pages of this blog – but to keep right up-to-date on things, be sure to visit the Fantasy Faire website, and follow the event via the social media links below. The Lost Unicorn Gallery, curated by Natalie (Natalie Montagne) forms a part of a trio of regions I visited in September 2018 (see Within a Lost Unicorn Forest in Second Life and Opening a Storybook in Second Life). As I noted in those articles, all three regions are utterly magnificent in design, with The Lost Unicorn Gallery offering one of the most stunning settings in which art can be exhibited – as any view from outside the gallery will more than demonstrate. I was drawn back to the gallery for three reasons: the first is that Natalie routinely hosts engaging ensemble exhibitions of art; the second is that the featured artist for February 2019 is Cybele Moon (Hana Hoobinoo); and the third is purely personal: as a part of the current ensemble exhibition, Natalie has selected some of my own images. Cybele Moon’s work really needs no introduction to regular readers of this blog. Her art is beautifully ethereal and rich in narrative. This is fully exemplified with Forests Were Made For the Hunter of Dreams. Located on the main floor of the gallery, this is an extensive exhibition of Cybele’s photography and art, each piece offered and ready to tell a story of its own. However, for those who prefer, Cybele offers a touch panel which will supply a short story snippet to accompany each piece. Also to be found on the ground floor of the gallery are avatar studies by Razor Cure (sch511), and Aquatic Arugula (Sugarfairy88), who offer very contrasting styles. Razor is additionally the first prize winner of a recent photography competition held within the regions, his entry with the other prize winners also being displayed on the ground floor of the gallery. On the upper floors of the gallery is a veritable host of artists: Lia Swahn, Gassamer Star, Luke Henuskai, Meriluu, Pan Aeon, Poly Elan, Awesome Fallen, SelenLily Galicia, Efinyn Jinx, Iruki Levee, Babydoll Tracy Colt, Antarctica Slade, Pretty Rexen, Aleriah, Roxi Firanelli, Duchess Flux, and myself. The majority of the images from these artists are focused on avatar studies, the only major exception being my pieces, which Natalie gathered from my visits to Lost Unicorn Forest and Storybook. My sincere thanks go to her for including me in such august company; I’m both flattered and honoured. For those who enjoy photography competitions, the Lost Unicorn Gallery is currently hold another with the theme of Lord of the Rings. Participants are invited to submit up to two images (raw or post-processed) representing any part of the Lord of the Rings novels (The Fellowship of the Ring, The Two Towers and The Return of the King). Submissions should be made to the Lord of the Rings Flickr Group and labelled “Contest Entry”, no later than March 3rd, 2019. A L$9,000 prize pool is on offer, with L$5,000 to the first place entry. Full details on entry can be found via the contest information givers at the gallery. Imagine you had a small personal fortune. Enough to, say, buy your own tropical island atoll. What might you look for in such an island prior to purchase? What might you do with it? What style of house would you opt to have built there? What facilities would you want to include to make it that special place where you can escape the pressures of life and simply be, enjoying sun and surf and the haven of tropical splendour with your family and / or friends? Doubtless, many of us have fantasised having a life where we could “do a Branson” and have such an island – and I wouldn’t at all be surprised if in our individual mind’s eyes, it didn’t in some ways resemble Originalia. Designed by Minnie Blanco (Minnie Atlass) of Soul2Soul fame for region holder Amase Levassuer, Originalia is an utterly stunning Full region this fully embodies the idea of a tropical paradise home. And if you’ve never dreamed of having such a place to call your own, or in letting your mind wander the fantasy of owning a private island getaway you’ve not pictured anything quite like it, I’ve little doubt that after a visit, you’ll be unable to picture anything else. Set within an archipelago of off-sim islands – some quite mountainous – Originalia offers what could easily be the atoll top of a drowned volcano: an oval of sand and rock rising above the surrounding sea, the wall broken to the east, allowing the waters to enter the crater’s bowl to form a lagoon. Beyond the curve of the island lies an outer semi-circle of low-lying rock, home to scrub grass and palm trees. It suggest that perhaps at one time the cone forming Originalia sat within a larger caldera, perhaps the last gasp of the volcano that formed it, pushing itself above the waves before falling silent, and then allowing the millennia and the sea take over the work of giving the land its current form. Whatever its origin, what remains is perfectly idyllic; a horseshoe-like island running from sandy lowlands to the north around to a high ridge-line to the south, the ring of rock open to the sea to the east and also linked to the waters of the old caldera to the west, where the crater wall has in part collapsed to leave a magnificent arch of basalt arching over the waters below, thus forming a broad bridge linking the high plateau with the lower reaches of the island and the beaches there. It is on this high shoulder of rock, from which waterfalls tumble from numerous points, that Minnie has sited the ideal residence: The Patron Banyan House by Eliza Wierwright, itself a stunning build that has always impressed me. Offering a southward view out over the lagoon, the house grandly sits on the high plateau, the pool between its arms feeding one of the falls that tumble over the rocks and into the blue waters of the lagoon below. Across the rocky arch from it sits a rotunda like cottage by Cory Edo, perfectly complementing the house and offering a spa style setting in which to relax. The overall suggestion of house and cottage perhaps leans toward Thai in intent; but as is often the way with me, the setting carried soft echoes of places I’ve visited in Sri Lanka, such as Saman Villas. While the latter is far, far more developed than Originalia, I Couldn’t help but think of their rocky perch and the open-air nature of the public buildings within the development as we explored the house, memories of meals in the open-sided restaurant drifting into my thoughts. Finding your way around the island is easy: just take the wooden board walk and bridge from the little sand bar of the landing point, then follow the rocky paths laid across sand and scrub. These wind over island and up hill under palm trees and between shrubs and rocky shoulders. Here and there the paths branch, offering routes to the outlying beaches where little hideaways can be found and boats bob on the surf at their moorings. I’m not sure if Originalia is permanently open to the public, or whether public access is for a limited time. However, I do know that it is a setting that not to be missed – but do allow time for a visit; there is much here to captivate the eye and the imagination. And do make sure to have local sounds enabled; as something of a sanctuary for birds of all kinds, Originalia has a rich accompanying sound scape. Our thanks, once again, to Shakespeare and Max for pointing us to this island gem. As Minnie points out in the comments, those taking photos are welcome to submit their pictures to the region’s Flickr group. The following notes are taken from the Content Creation User Group (CCUG) meeting, held on Thursday, February 21st, 2019 at 13:00 SLT. These meetings are chaired by Vir Linden, and agenda notes, meeting SLurl, etc, are usually available on the Content Creation User Group wiki page. Vir has been assisting with the clean-up following the inventory issues users experienced over the weekend of February 9th /10th. These apparently impacted a number of SL’s back-end services and are still being worked on. A planned change for Animesh designed to throttle the number of complexity updates for avatars and Animesh objects actually never made it into a release viewer. This will now likely get pulled into the (non-public) viewer repository where Vir is experimenting with Animesh follow-on work. The lack of this throttle has meant that some TPVs have implemented their own throttles on these complexity updates to reduce their potential impact. Will there be attachment points for Animesh? Currently unknown. Vir will be investigating options; attachments to Animesh won’t function in quite the same way as avatar attachments, so the optimal mechanism needs to be determined, if possible. One option might be to have attachments behave as part of the Animesh linkset, but have a flag set for them that forces them to be displayed in the required location when used. This doesn’t allow the full range of capabilities seen with avatar attachments, but it would allow the attachment to be made, and the Animesh complexity calculations to be properly updated. It is hoped that the current project viewer version of the EEP viewer (version 6.0.2.524476, dated Tuesday, February 19th) will be the last before EEP moves to viewer release candidate status. There are still a couple of bugs to be hunted down which may impact the promotion. Rider hopes to see the viewer go to RC status before the sider code for EEP moves beyond the LeTigre and BlueSteel simulator RC channels, to allow more widespread testing of the viewer once it is in RC without the risk of bugs impacting other simulator updates. People using the EEP viewer (project or RC, once it has been promoted) should see no difference in behaviour when using it on non-EEP regions. A further appearance server update is required to fix the “black skirt” issue that can result in an avatar appearing to wear a long, jet black “skirt” when seen in the BoM viewer. As noted in my previous Content Creation UG meeting notes, there was some discussion on textures and uploads, during which, Beq Janus suggested making it possible for users to select more than one image resolution when uploading textures to the viewer. 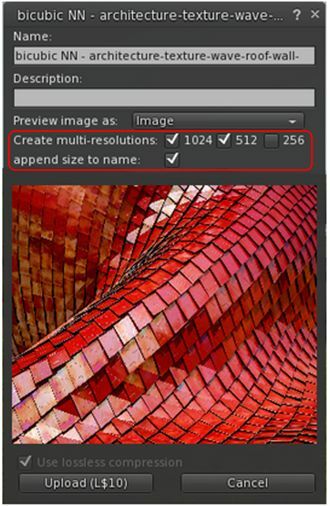 The idea here is to encourage people to experiment and see how the different resolutions work on surfaces, rather than always automatically opting for the highest resolution (e.g. 1024×1024), which might not always be required. A feature request was subsequently submitted for this – see BUG-226352 – which has been accepted. It’s not clear if / when this might be implemented, although it is acknowledged as being “a nice thing to have” (particularly given the different resolution mipmaps are generated at upload anyway, but only the selected resolution is made available). It is not clear how much would be involved in the necessary back-end updates required to support the idea. Also, the usual caveat: “accepted” means the idea is something the Lab is interested in tracking / possibly investigating. It doesn’t automatically mean a feature request will be implemented.